to use at a great place." Many businesses offer all kinds of things for new customers and forget about the ones who already spent money with them. Not us - we want to offer our loyal clients something really special. Our rewards program is free to join and is available to our current and past clients. For Our Free $15 Gift Card! - Earn Rewards Dollars: With every purchase, earn a cash back percentage of your invoiced amount to use towards future purchases. - Dontate to Charity: You may donate a portion of your Rewards Dollars to local and national charities. - Better Communication: Receive customized repair, maintenance, and appointment reminders. - Referral Program: Earn rewards dollars toward future visits when someone you referred comes in for service. 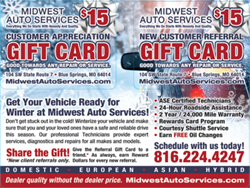 - Earn Free Oil Changes: It's simple; buy 5 and get 1 free! - Nationwide Roadside Assistance: Every purchase, no matter what it is, comes with 1 year of roadside assistance and towing. This program covers up to $100 per occourance and has a very simple reimbursement procedure. Click to read more at our roadside information page.